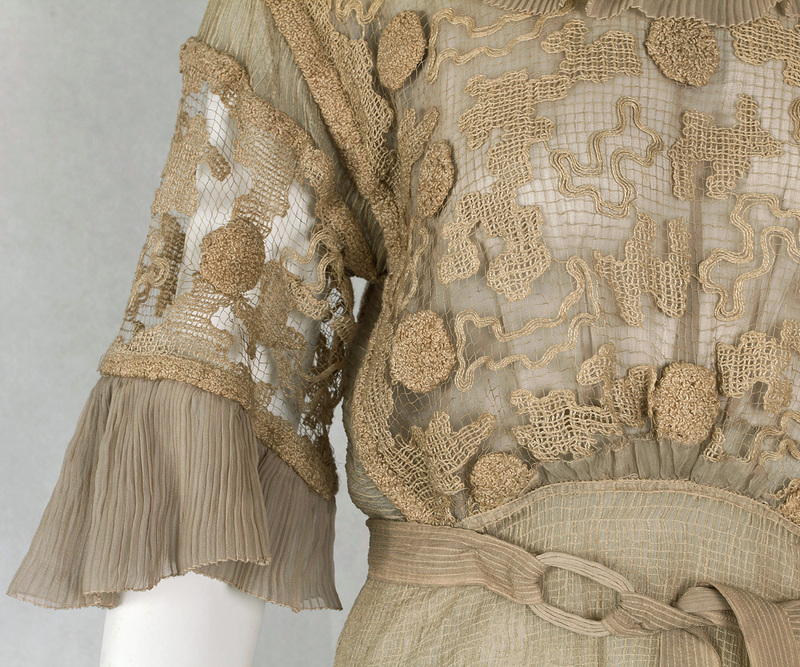 In vintage costume, the art of embellishment reached a pinnacle in the early 20th century. This graceful design combines sheer silk chiffon totally covered with rows of pin tucks, pleated ruffles, and textured filet lace. 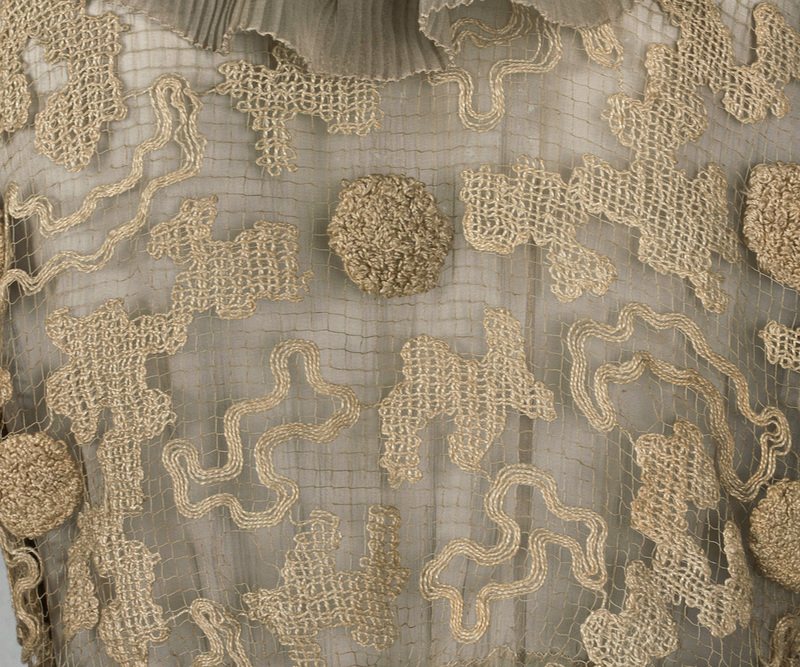 The net ground of the gossamer filet lace is embroidered with a Chinese-style pattern rendered in silk floss. With their three-dimensional verisimilitude, the round medallions of curly floss are of the last degree of charm. The long slender dress embodies understated elegance at its best. Everything is soft and feminine, including the self-belt at the waist. 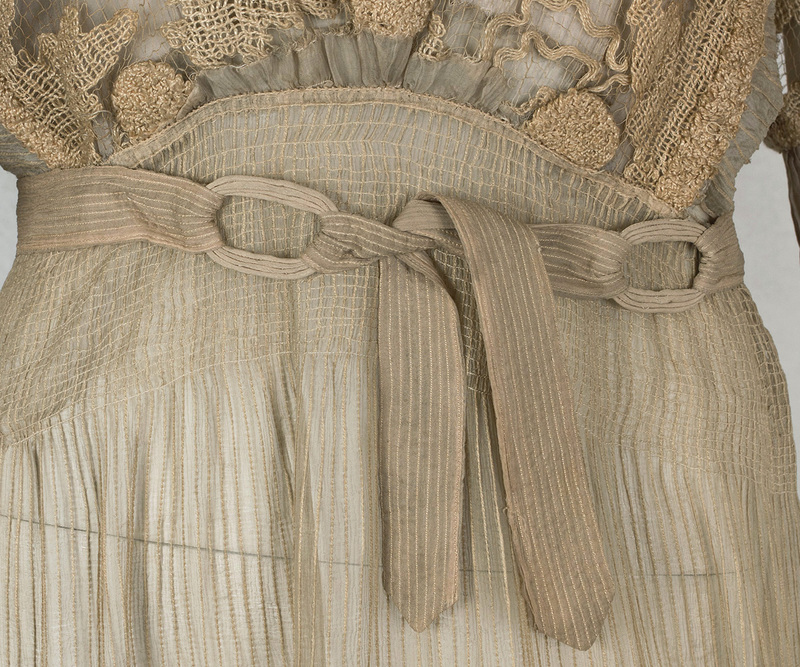 The bodice is lined with matching silk chiffon; the skirt is unlined. 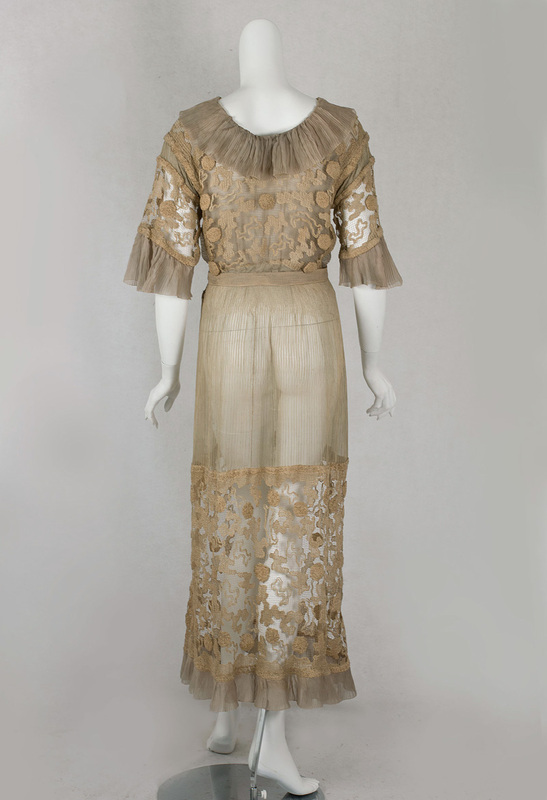 Without the original underpinnings, this artistic dress is sheer and will need a slip. It closes on the side with small hooks and snaps. 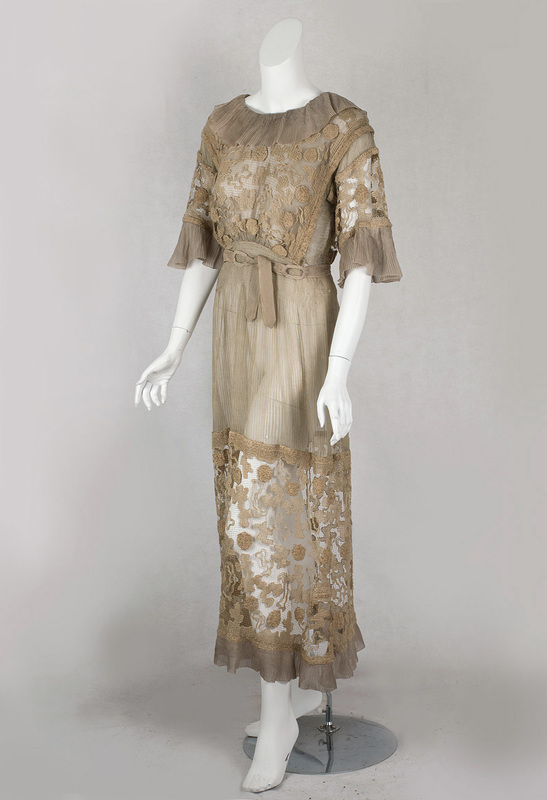 The tea dress or robe d'intérieur was a type of déshabillé ("undress") that appeared in the 1870s when day and evening dresses were tightly fitted. 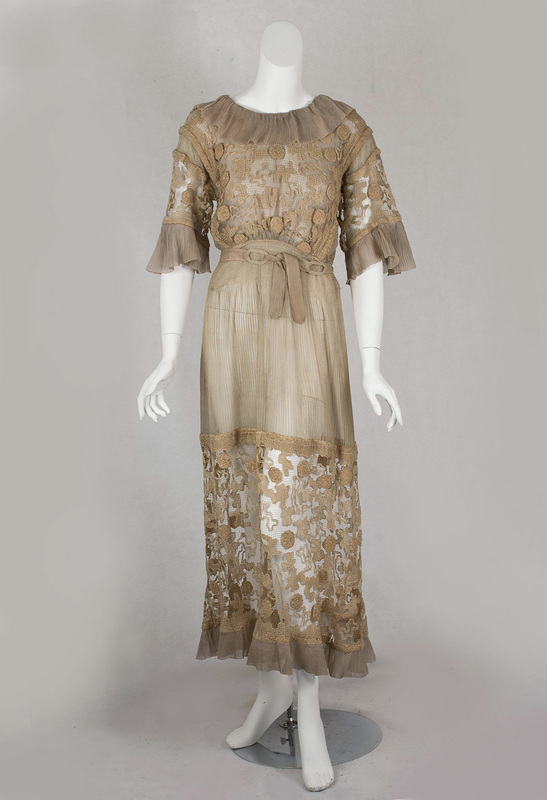 A welcome alternative was the tea dress: more comfortable, artistic, and fanciful. The condition is very good. 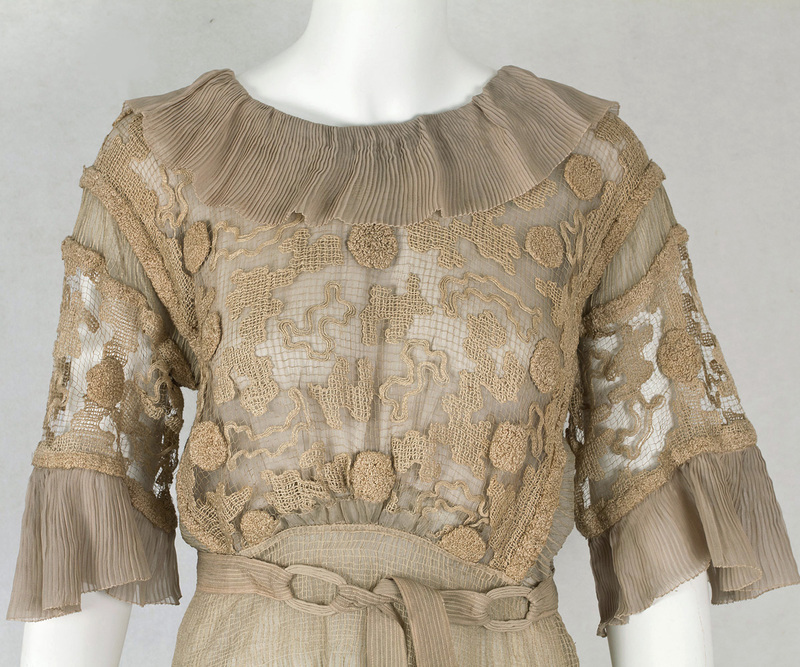 The occasional small flaws are reflected in the price: breaks in the net ground of the filet lace hem border; and a few very tiny holes in the pleated silk skirt. When wearing a slip, these minor imperfections are not visible and hence do not spoil the appearance. It measures: 36" bust, 28" waist, 44" hip, 15" from shoulder to waist, and 54" from shoulder to hem.